I've had mixed experienced with platform games dating all the way back to the Super Mario Brothers era. They're certainly fun, I'll admit that, but they eventually reach a point when the skill level proves a bit to challenging for me and the fun gives way to frustration until I eventually quit the game. Thus cooperative play platform games have always felt like a decent compromise. You still get that mix of fun and challenge that we all associate with platform games but the addition of friends playing along leads to a bit of a safety net of sorts. Now when you're near death another player might be able to do something to save you at the last moment. Or at the very least you have someone to talk to as you all try to figure out the stage's puzzles together and all that good stuff. And thus my fascination with local co-op games versus network co-op games. I really like to be able to be in the same room with the people I play with since you get a lot of side banter that never perfectly translates well to the network experience and of course you eliminate any possibilities of latency and such. And so we get to this particular game, something right out of the classic console era. And man it's such a fun game. Rayman Origins is a side-scrolling platform game and part of the popular Rayman series of games that first appeared in 1995. 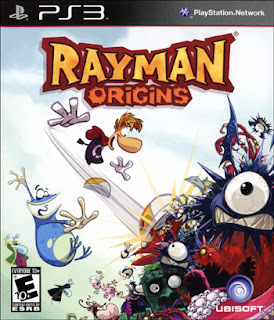 The game was developed by Ubisoft and has been released on multiple gaming console platforms including the PlayStation 3, Xboc 360, Wii, and the PlayStation Vita, to name a few. The game begins with Rayman, Blobox and some Teensy friends fast asleep along with the Bubble Dreamer. But their rather musical snoring and sleeping pattern eventually angers Darktoon creatures who live deep underground and they eventually come swarming out. 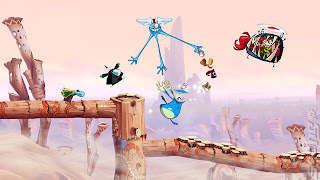 Thus now Rayman and his friends need to travel across the world as they fight the Darktoons, release the imprisoned Electoons and rescue Betilla and her fellow Nymph sisters, who are being held prisoner. The story behind the game is simple enough and is actually communicated without words. I'll admit I only fully understood things by researching online given my lack of familiarity with some of the Rayman character. On the one hand, it's bad that the game seems to favor older fans of the series a bit more. On the other hand, you could argue that the lack of dialog doesn't really put too much importance on the characters and thus you're free to just jump in and play and your leisure, which is actually what we did. The game features a nicely seamless drop-in / drop-out local co-op feature that makes it easy for new players to just grab a controller and join the fun or leave their controller behind and wait for their character to disappear. The game is a lot more fun with fellow players not only because you get to puzzle through the challenges together but there's also a bit of competition in terms of how many Lums each player can collect since there will be a sort of ranking at the end of every stage. Plus "dying" in the game involves you blowing up like a balloon and you can be easily revived once a fellow player slaps back into reality. The challenges are pretty fun - a lot of classic platform stuff like the need to hit enemies at precise locations to avoid death and a fair amount of acrobatics as you navigate the various stages. The different realms have wildly different environments including a pretty windy dessert and of course slippery ice lands as well. The diversity of the stages really adds something to the game and keeps things nicely fresh. Plus they also shake up the gameplay with new skills like the ability to glide or adhere to walls that help you find new areas, hidden secrets and everything else that makes platform games so much fun. Whether single player or co-op, the game is a lot of fun and features a lot of the zany fun that comes with the Rayman series. Personally I prefer the co-op mode since it increases your chances of collecting more Lums in order to hit certain in-game achievements and bonuses. Remember, the more Electoons, the better for the game as a whole! And beyond unlocking secret areas, more Electoons means more costumes for you characters, thus adding to the fun. 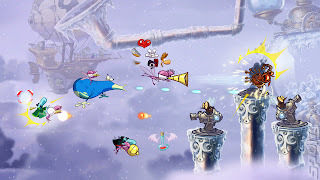 Rayman Origins is a fun return to classic side-scrolling platform gaming at its finest married to modern co-op gaming fun. Thus the game gets 5 silly madcap antics as your character slap one another out of a possible 5. Rayman is definitely back. The animation for the 2D animation is quite gorgeous. The audio is topnotch as well.